THE Standard Bank Joy of Jazz festival is upon us. Standard Bank National Youth Jazz Band that will be performing on Friday 28 at the Sandton Convention Center. Win tickets to see them live. Last night both local and international jazz artists were given a rousing welcome at the function hosted and addressed by the CoJ Mayor ntate Herman Mashaba. It begins today September 27 to 29 at Sandton Convention Center. 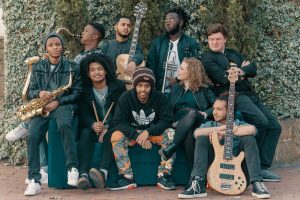 For the first time in its history the Standard Bank National Youth Jazz Band (SBNYJB) is under the tutelage of a female conductor, Amanda Tiffin. This year has also seen the rise of 18-year-old saxophonist from TUT, Moses Sebula, who has beaten the odds to secure a place in the annually-constituted youth jazz band. The band consists of UTC students Brathew van Schalkwyk on piano, Sean Sanby on bass, Damian Kamineth on drums, Ryan Truter on guitar, Daniel van der Walt on vocals, Ofentse Moshwetsi on alto sax; Moses Sebula on tenor sax and Siyakhula student Thabo Sikhakhane on trumpet and will present a repertoire that includes their original compositions and takes of well-known standards. In celebration of 20 years of sponsoring the 21st Standard Bank Joy of Jazz, you stand a chance to win ONE DOUBLE TICKETS valued at R1500 for Friday’s show (28) that features Standard Bank National Youth Jazz Band, amongst other top jazz exponents performing on the evening. Which band will be performing on Friday evening at the opening of Standard Bank JoJ? Send answer, name and contacts to info@sowetolifemag.co.za or Sydney@sowetolifemag.co.za on or before 5pm today 27. A winner will be contacted telephonically. Ts & Cs do apply! Keratoconus Foundation calls for more funding to operate your EYE!